On Wednesday Ezi Magbegor was putting the finishing touches on a group assignment at university, on Thursday she may find herself in the WNBA. Both Magbegor, 19, and her Australian Opals teammate Alanna Smith, 22, are tipped to be top-20 selections in the WNBA Draft in New York. In a conference call with journalists from around the world last week, several WNBA coaches and experts praised the pair who both were on the Opals team who won the silver medal at the FIBA Women's World Cup last year. Smith is likely to be a top-10 selection after starring with Stanford in US college basketball the past four years while Magbegor, who plays with WNBL club Melbourne Boomers, is one of the youngest players in the draft and is tipped to land anywhere in the top-20. While Smith is in New York to take part in official proceedings, Magbegor will watching from home in Melbourne with her family and friends. "I'm pretty excited and nervous," Magbegor said on Wednesday. "I won't quite know what happens until draft day, but I'm excited about where I might go. "It's definitely been in the back of my mind this year because as an international player I knew I would be eligible after playing two seasons as a professional. "It's crazy how quickly it has come up." Smith ended her college career at Stanford earlier this month when they lost out in the Elite Eight of the NCAA Tournament and she said it would be hard to leave college life and begin her professional career. "It has been the best four years of my life," Smith told media post game. "I don't think I'd be the person I am today without my teammates and my coaching staff and it is going to be very, very hard to leave." 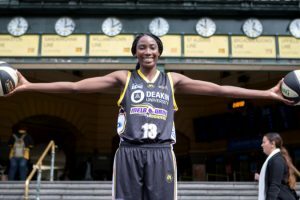 Smith is considered a likely top-10 pick judging from several different mock drafts as her skills and size look a good fit for a number of different teams looking for a player who can play as a 191-centimetre "stretch" power forward. Magbegor, a 193-centimetre forward-centre, is harder to place due to her age but she has more upside than many others players in the draft. Magbegor has been working hard on her game with Boomers coach Guy Molloy and the Geelong Supercats in NBL1 where she is playing this winter. What happens after Thursday will be decided once she has a team, with the WNBA season set to begin in May. "The WNBA is the best league in the world and a league I've grown up watching," Magbegor said. "To be in contention to play in this league is definitely something I've dreamed of for a while." While Australian star Liz Cambage’s playing rights still sit with the Dallas Wings, she recently requested a trade so some WNBA pundits have suggested a trade could occur on draft day should a team put together a package good enough to tempt the Wings into a deal. The Wings will at least have one more new Australian for this season with Adelaide Lightning star Nicole Seekamp signing with the club in February. The Las Vegas Aces have the first pick and there are 36 total selections. The WNBA Draft is in New York on Thursday starting at 9am (AEST).